It’s been about ten days since I flew across the ocean and backward in time from Paris to San Francisco. It was a beautiful stress-free journey, one that put my anxieties for long-distance flights at ease. For some reason, everyone was particularly nice towards me. From the Airport in Paris through London Heathrow and the flight attendants of the long-haul flights all the way to the immigration officers at the San Francisco Airport (somewhat of a surprise considering the extent to which I am often harassed while traveling through airports). By the time I got to my hotel, I was exhausted. My eyes were heavy, not from sleep, I think, but from a sense of having survived the vortex of a time warp. By now, my internal clock was nine hours ahead. Everyone around me was working in slow motion. Or perhaps I was walking backward. I have been invited to San Francisco as a guest lecturer in the MFA Photography program at the Hartford University. I was to join the faculty in a weeklong event involving portfolio reviews and critic sessions of works by students of the program. The Hartford MFA Photography program, as I have come to believe, is predicated on the idea that photography’s language and reach is expansive across historical and geographical context. Thus it is a roving Masters program that sees the students meeting with the faculty and guest lecturers in different cities mainly between Europe and the United States. My first time with the program was in the summer, in Berlin. Now, here in San Francisco, at Fort Masons Art Centre, against the backdrop of the Golden Gate Bridge to the left, and the Island of Alcatraz to the right, linked together by the awe-inspiring San Francisco Bay, we got down to the business of intense review of works by the students. Every moment of the session was as much a learning process as it was an occasion to unleash a wealth of experience gained over 15 years worth of engagement with photography. My work over the years is firmly situated in the quest to understand, or rather inhabit the space that lies in between distances. I often make reference to my coming of age in the first decade of the 21st century having begun my artistic journey in 2001. In other words, I am of the generation of artists and thinkers who found themselves surrounded by a rich repository of postcolonial thoughts aptly stretched and articulated by some of the greatest thinkers of our time. Thinkers who sought to deconstruct the myth of Occidental hegemony. Thinkers the likes of Edward Said, Gayatri Spivak, Homi Bhabha, Stuart Hall (to name a few), whose work, in turn, expands on precedent dispositions necessitating historical turning points marked by the revolutionary tendencies of the late 1950s through the 70s. As such, I am acutely aware of the need, and indeed interested in how through our work in the present century, we further the deconstruction of long-imposed cartographies by finding new, constructive methods of accounting for the cross-references and intersections between places and peoples across time. In the class, I often try as much as possible to inject a perspective of a world propelled by intricate correlations of subjectivities by drawing references from beyond the history of photography (which is richly American, and rightly so). Sometimes I find myself encouraging a student or two to retract an overly generalised point of view of which the premise is rooted in a Western, American esoteric knowledge. For instance, such words as “universal” or “humanity” are occasionally thrown around with little attention to how politically loaded they are. The same words could represent entirely different realities to two different people. And this difference could easily be attributed to the roles such words have played so far in the systemic marginalisation of peoples – how these words have been used on several occasions throughout history to assert the privilege of one group of people at the expense of many others. To further drive home my point, let us look at the national motto of France: “Liberté, Egalité, Fraternité”. This expression, very much rooted in the French Revolution, is considered by all standards positive – a declaration of noble intentions. But history, however unpopular, also tells us that the French Revolution, and by extension this expression which translates to Liberty, Equality, Fraternity rode on the backs of slavery and to a large extent, set the stage for colonialism which subsequently replaced slave trade. So today, it should not be taken for granted that these words do not mean the same for everyone. If we must use words and labels, it is imperative that we are conscious of their epistemological foundation in relation to what they may imply today. How then might one consider the term universal? If I were to offer a suggestion, I would say it is a point of intersection. That point where one person’s universal crosses or enters that of the other in all tensions, unfamiliarities, pluralities and hopefully, the eventual harmony that this often-sensitive point engenders. Perhaps this is a tad too utopic. I say this because outside the classroom, I am confronted with San Francisco. The city is a perfect melting pot of Americans and migrants from myriad heritage: Chinese, Mexicans, Africans, and many more. Everyone seems to be getting along fine and cultures seem to have blended into each other (I witnessed with admiration how much most San Franciscans I met could manipulate chopsticks). However, beyond the veil of conviviality, there are huge economic disparities. Here, there is almost an unreconcilable gap. San Francisco is today the “tech city”. With big companies such as Uber and Air BnB headquartered there and Silicon Valley’s Palo Alto just 50 minutes drive away, it has become the enclave of young six-figures-salary tech employees. While in San Francisco, I stayed briefly in Mission District, considered the heart of the city. Like Chinatown, this distinctive neighbourhood with its urban multicultural feel helps define San Francisco. And as is always the case, it is the part of the city hardest hit by an alarming rate of gentrification. Mural. Mission District. San Francisco. ©Emeka Okereke 2017. Though I spent a few days in the district, I had the fortune of being shown the neighbourhood by an artist-friend who has lived there for some 11 years. During our evening walk through streets ridden with murals often political in nature, she took her time to show and explain the signifiers of this dismaying phenomenon: old houses, some of them more than a century old with colourful facades and contained windows are being replaced by space grey and wood colour buildings with exaggerated windows, and facades that look too orchestrated and synthetic. You see these buildings and you immediately think of the iPhone with its carefully crafted minimalism, designed to look and feel expensive. The original inhabitants of Mission district are mainly Mexicans and Central American immigrants, but also a bit of African Americans. 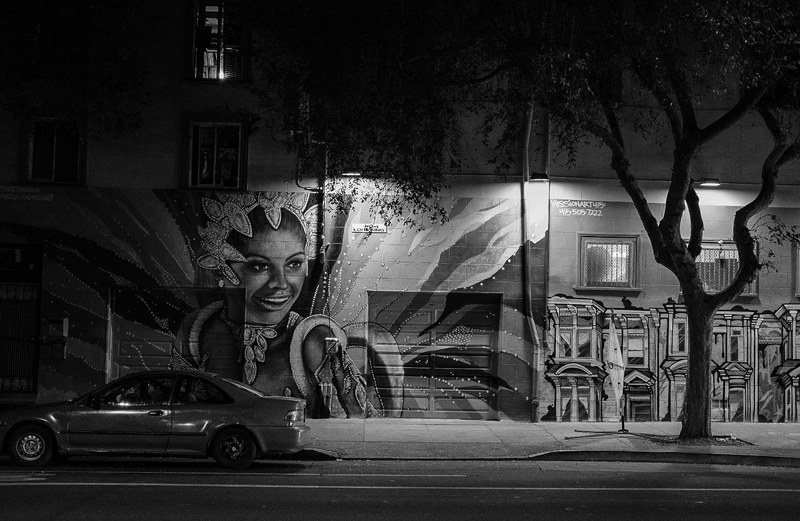 The murals on the walls are often expressions of desperate response to the anxiety of having their neighbourhood pulled from under their feet – overnight. They are fighting back. During the day, a prominent feature of the city is homeless individuals with polyester tents sleeping under bridges and sidewalks. The image is a juxtaposition of a homeless man or woman side by side a ridiculously expensive looking automobile with a plate number that reads “California”. Well, a quick insert: this is not the California I was sold through Hollywood all through my life. Much worse is the sense that this is not an anomaly, neither is it a temporary phenomenon. It is intrinsic to the fabric of the city. It is normal. But also, it has become normal to say it is normal. 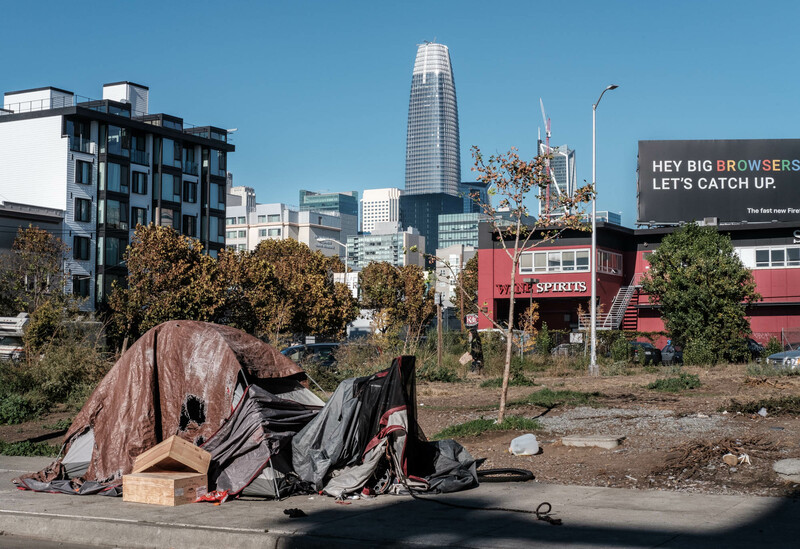 San Francisco is probably the first Occidental city I visited in recent times where it seems that (and this is purely a surface observation) poverty does not run exclusively along racial lines. People from different race categories are represented in this situation of homelessness – Hispanics, Asians, Blacks, as well as Caucasians. I saw many of them line up in front of Mission District’s shelter and employment agency looking for respite. Overlooking Financial District. San Francisico ©Emeka Okereke 2017. Art and art spaces are not spared. The galleries, as I was told, had to move from Mission District as well. Now they are mostly housed in a complex called Minnesota Street Project at the Dogpatch District – this district, too, is struggling under the weight of gentrification. There are quite a few art spaces in San Francisco in general. One of them is Kadist still located at Mission District. A mellow, low-key but resourceful art space dividing their base between San Francisco and Paris. There is also Pier 24, the Photography Museum housing collections from the collector Andrew Pilara. This not-for-profit art space now turned photography museum, dedicated to showcasing the works of renowned photographers, mostly Americans, is a marvel. There is a powerful reverential quality to how the works are presented to the visitors. The photographers in the collection are some of the best the entire history of photography can boast of. During a scheduled visit with the students of the MFA program, we met the collector who showed us around and gave some anecdotal insights to the founding of the space and the collection it houses. What is most commendable is that the works in the collection are not resold. In the future, all of them will be transferred to the permanent collection of the San Francisco Museum of Modern Art. This is great. 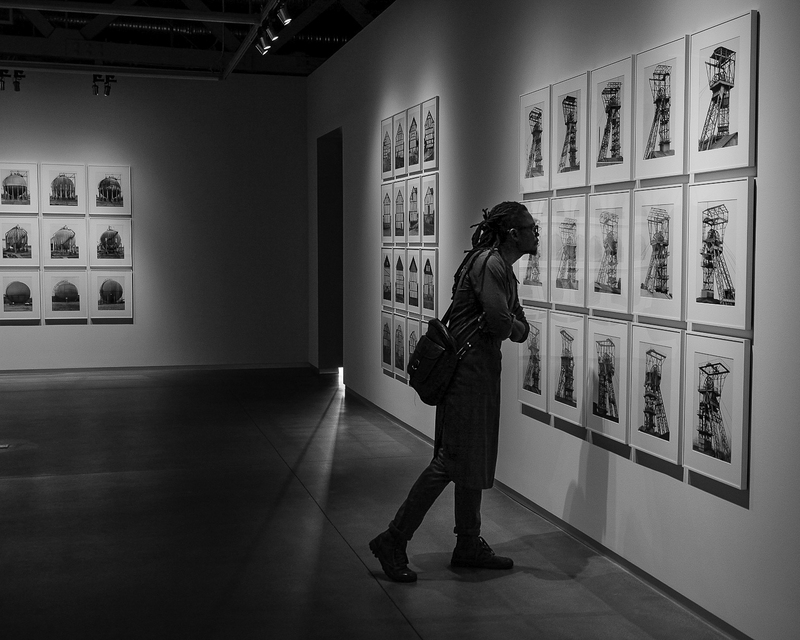 However, one cannot help but feel the weight and power of money as an overarching arbiter for a photography institution that is largely based on a collector’s personal taste or, as he said, feelings. And if as James Baldwin once implied, power and money in America is a metaphor for whiteness, “which is simply a way of describing Chase Manhattan Bank” then I wonder how Pier 24 Photography addresses this in its collection much less in relation to the economic disparities directly outside its walls. Put your ears slightly to the ground, and you will hear people blaming multinational tech companies for breeding a hoard of young “dreamers” who are out to take over the city. You feel the tension most intensely in a place like Mission district. San Francisco is an incredibly beautiful city both topographically and in terms of the warmth and hospitality of its inhabitants. Like Lagos, San Francisco is a place where you can make tangible friends out of strangers by just a chance meeting on the street, on a bus, or while hiking. But this economic disparity looms over the city’s charming demeanour like an elephant in the room. I, for one, suspect that the problem goes beyond the influx of new technology company employees. The problem is rooted in the illusions of the American Dream, which today is no longer restricted to the American. A dream that brandishes beautiful facades while sweeping under the rug and bridge, the ugly, dense precipitates of its flowery indulgence. The problem is not so much the dream as it is a value system that places inalienable importance on materiality as the measure of all success. A misplaced priority to the detriment of all humanity. Next Post“Water No Get Enemy”: A Thing or Two About Running.